I hope you dont mind me asking, and will be able to help me! I notice you have had success with the PIC PAL Library from Bruno @ Micro Examples, I haven’t tried constructing this project yet, I have, however, tried constructing the PIC PAL Super Imposer project, and I have not been able to get it to work, I get a lot of “camera roll”, I was just wondering if you had managed to get it to work at all, or know how to use the PIC PAL as an overlay device? About the OSD (Super Imposer project), I tried that before making the other project, as I thought it would be easier, as it did only require a PIC12F (8-pin). So no, I never got the OSD to work – so no, I’m sorry, I don’t know how to use the PIC PAL library as an overlay device, which is OSD! I was having a look at the library, if I dont “clear” the screen, connect the input to the output would that work as an overlay or do you think it would break the signal? I had to change the CLIP_LEVEL from 300-0 for the OSD to display anything, but the sync is all jittery! Do you have any information about using an LM1881 with a PIC as a OSD at all? I don’t think connecting the Input and the output would break the signal – but I don’t think there will be any overlay… The input will be the same as the output! I really liked that board with 3.5″ TFT ,, Just want to know from where you got the datasheet of ILI9919 ?? i have a problem with my development kit(mcbstm32c) and its lcd.i want to load pictures and show it, but i couldnt find a suitable converter.Could you send the converter, you mentioned other pages written on vb.net. I dont’ know the MCBSTM32C, but if it is a 320×240 pixel color display, then you can use my converter. You can download it here: http://elec.tkjweb.dk/BinaryImageCreator.zip – remember, this is only a beta version, so bugs can occour. You also have to quit and start (restart) the program everytime you have to convert another picture – you can’t convert pictures in a row, just by selecting another! I really don’t know, as I don’t know the screen on that Keil Development board. If you could give me more specifications about that, then I might able to help you. I am a student at university and I am working on a project in which I need to display icons & menus on TFT LCD. I am using the STM3210E-Eval board with an STM32F103ZE microcontrollar. I’m runnig the demonstration software for the STM3210E-Eval. I displayed the main menu & the icons and now I need to change these icons with some other icons according to my application to load them after that to the Internal Flash. I haven’t got a STM3210E-Eval board myself, though I have looked on the code. If you are going to have the icons saved in the internal flash, then it’s easy. You have to make a constant array with the color information! If you need to have the icons in the external flash, then you probably have to make an empty project with different vectors moved, and then make a constant array in there – but I don’t know! I’m building a Daft Punk-esque Disco Table, and I’ve been running into some issues (because I’m just getting into this whole world) it’s essentially a 5×5 Dot matrix, but each pixel is made up of 4 LEDs. I thought your USB controlled board was a great start, but could you help me with the rest? 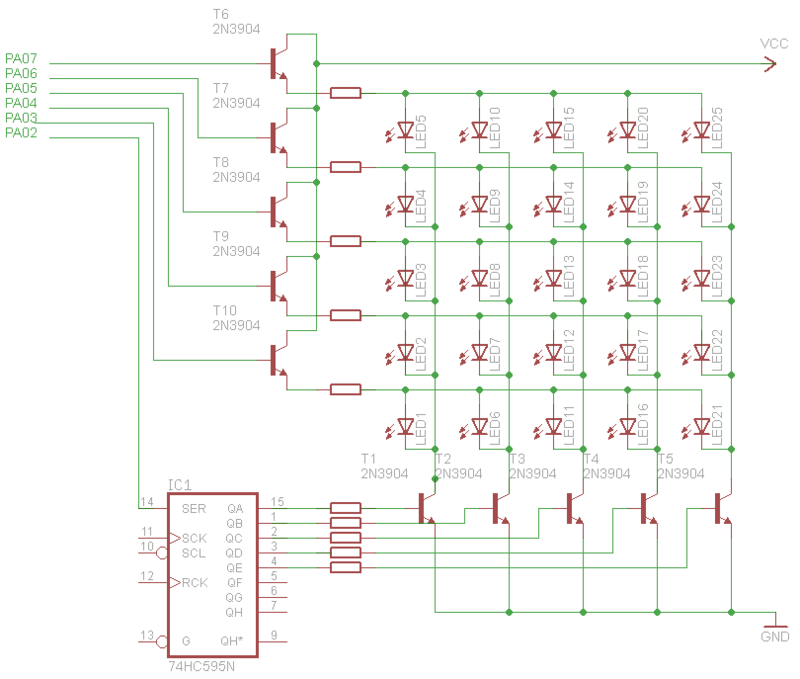 This is what you will have to do, except that you will have 4 LEDs connected together for every single LED on the schematic. Exciting website you have here 🙂 – I like your weather station a lot! HTX is also very known thing in Denmark, especially for technology interested students. I have the memory that I’ve seen your post somwhere in a Chinese forum…?? Friendly ARM? U got that in China? I am now using Keil MDK on Windows, with ST’s firmware library. Frustrated a lot by that… Even worse, with that I can’t make the peripherals workingâ?¦â?¦andâ?¦â?¦andâ?¦â?¦ many problem, Totally worse. What STM32 Lib do U use now? Or write a Lib yourself by operating the huge amount of REGs? Could you give me some suggestion about STM32 development? Yes that’s right, I’ve got the FriendlyARM kit from a chineese supplier. In my STM32 development I use ST’s own firmware library, which I find very usefull and straight forward! You just have to remember to include the right files – take a look at the examples in the ST firmware library ZIP folder. So May I Ask for Advice from U in a frequent time? After I complete the RTOS port at STM32, I will begin to develop a small robot which can sample image and send to workstation base on ARM9. Have you get up? haha ? Hi, could you contact me on my email. I have got your mail last saturday.and reply you yesterday.could you receive my mail?your feedback will be appreciated. I need to show some jpg images using STM32, it?s powered by the STM32F103VC6, stamp board from POWERAVR/POWERMCU, with a 3.2″ LCD Model HY320 (ILI9320). Could you give some suggestion? I’m sorry to say that I haven’t tried doing JPG-decoding yet. I’ve only done, and used, BMP files for my display projects. If the question wasn’t related to JPG-decoding, then I could probably help you. I could also help you with JPG-decoding, but that would require me to get some knowledge about the format first. hi ! im from vietnam .. my english is not good , so i hope you can understand what i say 🙂 . i have project to graduate university . project is “paint in FPGA ” ( draw line , triangle , circuit …., ) i have many problems , now i haven’t complete project . can you help me ? please send me data to lexuancong252@gmail.com ….. thanks a lot !…. a friend from vienam. Sorry for not replying you before, your comment was unfortunately cought by the spam-filter and therefor never seen. Your video on how you did the oscilloscope by using ARM processor is awesome. I would like to ask you how did u learn STM32 ARM Cortex-M3 processor? I had a PIC background for 2 years. I have no problem with microchip explanations and guides on how to program PIC based MCU, but in ARM I found it the example they have given to blink the LED itself already quite so hard. There are no step by step guides on what you should do before the next one, etc. They just give you the code and hope you could understand what they are trying to say. What I am trying to say is, I am a newcomer to ARM Cortex-M processor and would like you to give me a point on how to learn ARM processor from ground up if you don’t mind (book to read, course to folow, etc). Short question, in the Keil uvision it says something like this. Sorry, something just happened to my text earlier, the last 3 sentences didn’t appear as it should be. So I retype it again here. First of Happy New Year. When I started with the ARM Cortex development I started downloading the standard periphirals library. This makes everything a lot easier, as you have a specific set of functions to use, when you want to change a GPIO or read an analog input etc. The ARM Cortex register set is a complex structure, and that is why a simple LED blinking example becomes very large when you are not using the standard periphirals library, as you would have to write to all the different register sets, to set them up properly. I just checked Keils documentation and ST’s reference manuals and nothing says anything about MODER – just as you say. But I haven’t heard about it before, and when checking the examples that comes with Keil uVision for the STM series, the Blinky example doesn’t use that. This code initializes all the bits on the GPIOC port to be Output Push Pull, ready to drive LEDs etc. I hope this gives a better understanding of the GPIO registers. Please refer to the reference manual for a complete table of the registers. Ahh, well that might be the reason why I couldn’t find it either. Well yes, that’s one of the new registers in the Cortex-M4 family. Please I want to know what does TKJ (turbo-alternator by ALSTOM) stand for ? TKJ is my initials, Thomas Kølbæk Jespersen, hence the name of the company.